Most spam is just annoying and clogs up your inbox. But other spam can be malicious, entrapping you with phishing techniques. Spam clogs and clutters your email, getting in the way of the emails that truly matter to you. It also can be used to phish for personal data or lure you to malicious sites that can infect your computer. Hackers use spam as a way to lure you to malicious sites or into financial scams. We’ve made sure Anti-spam filters and labels any spam in your email application, so you don’t have to waste your time trying to keep your inbox clean and safe. Both Avast Internet Security and Avast Premier allow you to download our Anti-spam, so you can stay safe from Phishing and not waste time with junk emails. 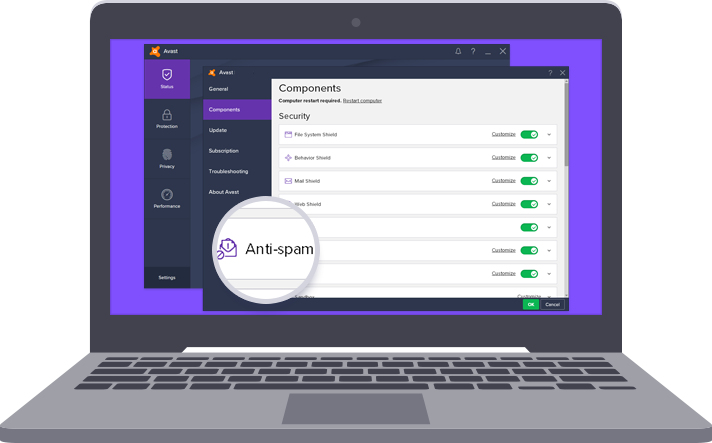 If you already have Avast Premier or Avast Internet Security installed on your PC, getting Anti-spam is a piece of cake: you open your Avast, click on ‘Settings’, and then ‘Components’. Look down the list of items and click on ‘Anti-spam’ to install and then customize your Anti-spam.